Dohrn Transfer traces its roots back to 1921. Charles Dohrn started the company with a single wood slatted truck, and only one route, every day running from Rock Island Illinois to Kewanee Illinois, and back. From this simple birth, through hard work and a strong focus on the customer, Dohrn Transfer grew into what was ultimately a 14 state carrier, with Charles' son Wayne and grandson Gary as part of the leadership team. In 1980, during the industry shift to deregulation, the decision was made to sell Dohrn Transfer to Tiger International, parent of the Flying Tigers. This was the right decision for the Dohrn family, but Gary Dohrn, 33 at the time, still had a passion for transportation. Tiger owned the Dohrn Transfer name, and Gary was not allowed to compete as a trucker, so in 1981, Gary founded Dohrn Storage and Distribution, a warehouse and local distribution provider, in Gary's hometown of Rock Island. Gary grew the warehousing company bit by bit, using the same customer centric focus that Charles had done 60 years earlier. A few years passed, and as Dohrn Storage was reaching a moderate size, Tiger International filed for bankruptcy. This allowed Gary to obtain the original Dohrn Transfer name, and to once again operate as a trucking company. In the years since then, Gary grew his new company into a leading Midwest carrier, servicing 9 states with a fleet of 550 semi tractors. Gary’s children, Heather and Joe, started working in the company over 15 years ago. 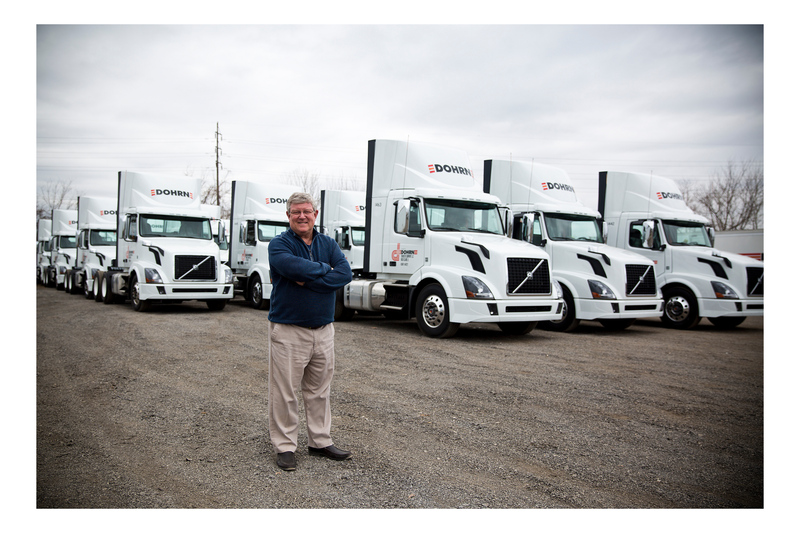 In recent years, Joe spun off a separate company that focuses on supply chain logistics, LogiFlow Services. Heather Dohrn continues to work for Dohrn as VP of Sales and Marketing making Dohrn Transfer a fourth generation trucking business. Thirty three years after Gary restarted Dohrn, a new opportunity presented itself. The Dohrn family wanted to take the company to the next level: to become a quality leader and a superior place of employment to our communities and to those employees who helped grow the company. Chuck Hammel, of Hammel Companies, was looking for an investment that supported his passion for family operated trucking companies. Gary and Chuck have both spent their careers in trucking, and both have families that have been in the industry since its beginnings. They also found they shared a vision and philosophy on what it is to be a leading carrier, and they both concluded that a Hammel Companies investment in Dohrn Transfer would empower Dohrn with the knowledge and resources needed to grow to be the carrier Gary always envisioned. Today, Dohrn Transfer carries on the tradition that Charles started with nearly a century ago. We are a family operated company, focused on being a quality employer for our Midwest region, and on the same attention to customer needs that our company was founded on. We also have the benefit of the Hammel Companies investment, and in the shared experience and knowledge of the PITT OHIO Transportation Group which includes PITT OHIO, US Special Delivery, PITT OHIO Supply Chain, ECM Transport, MCS,Palmetto and US Cargo. We look forward to continuing to service our customers and communities in the years to come.